The Normal Heart wins the Emmy: Larry Kramer’s success memorializes a lost gay generation (VIDEO). 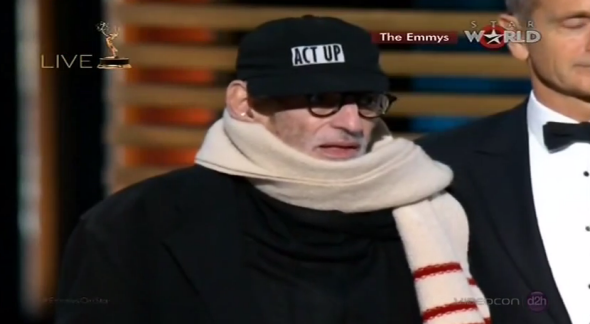 Larry Kramer at the Emmys. Murphy’s call is well-taken, but his earlier comments about the film being “for” Kramer echoed the sentiment with which a number of critics (including me and my colleague June Thomas) walked away from the movie: While a perfectly good film, The Normal Heart reads at this moment in time more as an act of hagiography and historical preservation than as an effective way to raise awareness or inspire action around a crisis in which the challenges and affected communities have shifted significantly since the 1980s. That said, memory is important, and we should all join Murphy in commemorating the lost generation of gay artists, thinkers, activists, and everyday people for whom Kramer’s work must serve as a monument.